On this day in 1885, 150 white miners in Rock Springs, Wyoming, brutally attack their Chinese coworkers, killing 28, wounding 15 others, and driving several hundred more out of town. The miners working in the Union Pacific coal mine had been struggling to unionize and strike for better working conditions for years. But at every juncture the powerful railroad company had bested them. Searching for a scapegoat, the angry miners blamed the Chinese. The Chinese coal miners were hard workers, but the Union Pacific had initially brought many of them to Rock Springs as strikebreakers, and they showed little interest in the miners’ union. Outraged by a company decision to allow Chinese miners to work the richest coal seams, a mob of white miners impulsively decided to strike back by attacking Rock Spring’s small Chinatown. When they saw the armed mob approaching, most of the Chinese abandoned their homes and businesses and fled for the hills. But those who failed to escape in time were brutally beaten and murdered. A week later, on September 9, U.S. troops escorted the surviving Chinese back into the town where many of them returned to work. Eventually the Union Pacific fired 45 of the white miners for their roles in the massacre, but no effective legal action was ever taken against any of the participants. The Rock Springs massacre was symptomatic of the anti-Chinese feelings shared by many Americans at that time. The Chinese had been victims of prejudice and violence ever since they first began to come to the West in the mid-nineteenth century, fleeing famine and political upheaval. Widely blamed for all sorts of social ills, the Chinese were also singled-out for attack by some national politicians who popularized strident slogans like “The Chinese Must Go” and helped pass an 1882 law that closed the U.S. to any further Chinese immigration. In this climate of racial hatred, violent attacks against the Chinese in the West became all too common, though the Rock Springs massacre was notable both for its size and savage brutality. A NHD documentary on the Chinese Exclusion Act. 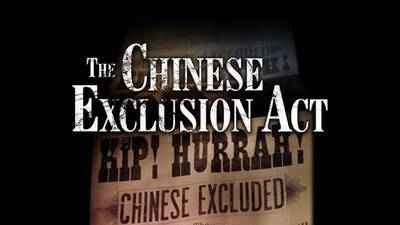 PBS will broadcast documentary film THE CHINESE EXCLUSION ACT on Tuesday, May 29th at 8:00 p.m. ET. This deeply American story - about immigration and national identity, civil rights and human justice; about how we define who can be an American, and what being an American means, is directed by Emmy-winning Directors Ric Burns and Li-Shin Yu. Synopsis: On May 6th, 1882 - on the eve of the greatest wave of immigration in American history - President Chester A. Arthur signed into law a unique piece of federal legislation. Called the Chinese Exclusion Act, it singled out by name and race a single nationality for special treatment: making it illegal for Chinese laborers to enter America on pain of imprisonment and for Chinese nationals ever to become citizens of the United States. The Chinese Exclusion Act, a two-hour film for national broadcast on PBS during the 2018 season, will explore in riveting detail this little known, yet deeply resonant and revealing episode in American history - one that sheds enormous light on key aspects of the history of American civil liberties, immigration, and culture - during one of the most formative periods of U.S. history. A deeply American story - about immigration and national identity, civil rights and human justice; about how we define who can be an American, and what being an American means - the film examines the economic, cultural, social, legal, racial and political dimensions of the law; the forces and events that gave rise to it; and the effect it has had, and continues to have, on American culture and identity. Directed by Ric Burns and Li-Shin Yu. Narrated by Hoon Lee and featuring the voices of Russell Wong, Fenton Lee, Yuet-Fung Ho and Josh Hamilton. Produced by Steeplechase Films and the Center for Asian American Media (CAAM). Premieres Tuesday, May 29, 2018 from 8:00-10:00 PM ET on PBS. The Certificate of Residence, a legal form of documentation that was added as a provision of the 1882 Exclusion Act when it was extended under the Geary Act in 1892. Every Chinese immigrant was required to carry a Certificate, or face threat of deportation. Over 100,000 Chinese residents refused to register for documentation under the Act- a massive act civil disobedience. Saum Song Bo, a Chinese law student in America, wrote a formal response in The New York Sun after receiving a solicitation for funds towards the pedestal of the Statue of Liberty. He points out the irony of soliciting funds for such an endeavor from a population deprived of basic American rights, "Whether this statute against the Chinese - or the Statue of Liberty - will be the more lasting monument to tell future ages of the liberty and greatness of this country, will be known only to future generations." Wong Kim Ark's 1898 landmark Supreme Court case citing the 14th Amendment established birthright citizenship, securing citizenship for all children born in the United States. Women detainees at Angel Island. Unlike Ellis Island, where 98 percent of incoming immigrants made their way through, eighteen percent of the applicants at Angel Island were initially rejected - and five percent deported outright - after grueling interrogations, and harrowing detentions. Ric Burns has been producing, directing and writing historical documentaries for public television since collaborating on The Civil War (1990), which he produced with his brother Ken and co-wrote with Geoffrey C. Ward. In 1989, Burns founded Steeplechase Films and since that time he has produced many award winning films including: Coney Island (1991); The Donner Party (1992); New York: A Documentary Film (1999, 2001, 2003); Eugene O'Neill (2006); Death & the Civil War (2011); American Ballet Theatre (2015); and The Pilgrims (2015). His films have received seven Emmy Awards, three Columbia DuPont Awards, and two Peabody Awards. Burns was educated at Columbia University and Cambridge University. He is currently at work on a film about the life and work of Dr. Oliver Sacks. Li-Shin Yu, a New York-based film editor, has collaborated with Director Ric Burns for the past twenty-three years. Yu and Burns are best known for their epic series New York: A Documentary Film, an eight-part production chronicling the city's rise from a remote Dutch outpost to the cultural and economic center of the world, for which Yu received a Primetime Emmy Award for Outstanding Achievement in Editing. Yu began her career collaborating with other New York independent filmmakers including Jim Jarmusch, Spike Lee, Sara Driver and Peter Wang and more recently with documentarians Christine Choy, Bill Moyers, Thomas Lennon and Stanley Nelson amongst others. On May 6th, 1882 – on the eve of the greatest wave of immigration in American history – President Chester A. Arthur signed into law a unique piece of federal legislation. Called the Chinese Exclusion Act, it singled out by name and race a single nationality for special treatment: making it illegal for Chinese laborers to enter America on pain of imprisonment; for Chinese nationals ever to become citizens of the United States; and for Chinese immigrants already here to leave the country and re-enter it. The Chinese Exclusion Act, a two-hour film for national broadcast on PBS in May of 2017, will explore in riveting detail this little known, yet deeply resonant and revealing episode in American history – one that sheds enormous light on key aspects of the history of American civil liberties, immigration, and culture – during one of the most formative periods of U.S. history. Repealed after 61 years in 1943, but still de facto in effect as late as 1965, this landmark piece of legislation – and the dramatic social, political and economic circumstances behind its origin, implementation and eventual repeal – forms a remarkable lens through which to explore key aspects of American culture, society and evolving national identity – at a critical phase in U.S. history, as America grew from a fledgling republic to a global superpower. A deeply American story – about immigration and national identity, civil rights and human justice; about how we define who can be an American, and what being an American means – the film will examine the economic, cultural, social, legal, racial and political dimensions of the law; the forces and events that gave rise to it; and the effect it has had, and continues to have, on American culture and identity. Thank you. It is a good document, giving a wide range of the views regarding the act. It stirs deep thoughts. Thank you for sharing! Yes I AM very aware of these tragedies along with the opium dens in San Francisco after the big earth quake in the early 1900's thankfully we are past some of these dark times but still more work to be done! Now we are debt slaves these days with the interest rates from the crash in 08.